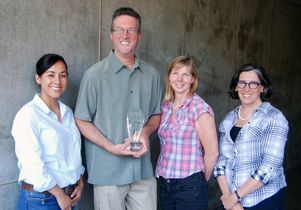 From left, Elizabeth Czornyj, Craig Merlic, Imke Schroeder and Nancy Wayne were recognized for their work with the UC Center for Laboratory Safety, while Wayne was also honored individually. 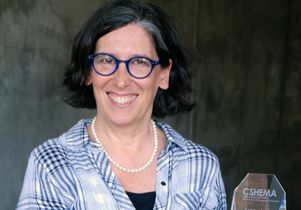 Nancy Wayne, professor of physiology and an associate vice chancellor for research at UCLA, was honored this month with a national award for promoting laboratory safety by the Campus Safety, Health and Environmental Management Association. The association also honored the UC Center for Laboratory Safety. Wayne, a distinguished biomedical researcher and chair of the advisory board for the UC Center for Laboratory Safety, received a 2017 Campus Leader Who Cares Award of Honor at the CSHEMA national meeting in Tucson, Arizona. She was recognized for her exemplary leadership and impact improving laboratory safety at UCLA. Wayne’s responsibilities include developing programs to address the regulatory requirements on principal investigators, clarifying safety regulations to researchers, improving communications between health and safety professionals and researchers, and improving the culture of laboratory safety campuswide. She is the founding and current chair of the UCLA Occupational, Health and Safety Coordinating Council, whose mission is to improve coordination among the different units on campus that address health and safety related issues of researchers and staff working with animals. Her laboratory conducted research to determine exposure risk of researchers and staff working with animals treated with the toxin tamoxifen and the carcinogen Bromodeoxyuridine — both commonly used hazardous chemicals in animal research. Her findings resulted in significant improvement in the cost effectiveness of animal housing while maintaining laboratory worker safety. 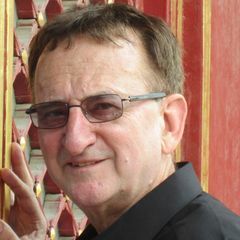 Wayne is founding chair and current member of the Office of the Vice Chancellor for Research’s Safety Oversight Committee that is charged with promoting a safe working environment in all research and teaching laboratories at UCLA. She was a member of the Association of Public and Land-Grant Universities laboratory safety task force that developed the 2016 Guide for Implementing a Safety Culture in Our Universities — a collaboration among researchers and health and safety experts from universities, industry and national laboratories. 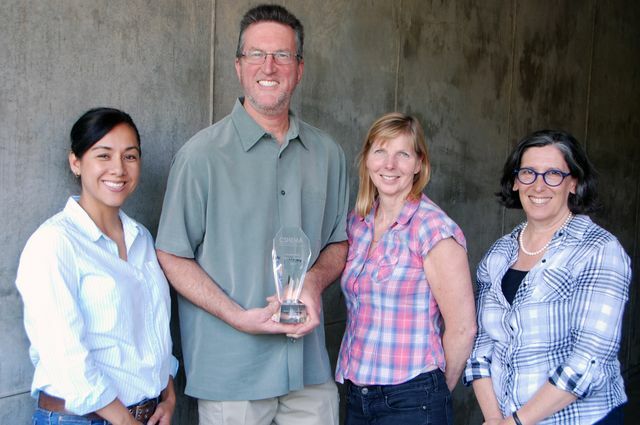 The University of California Center for Laboratory Safety received a 2017 CSHEMA Innovation Award of Honor. The center’s executive director is Craig Merlic, professor of chemistry at UCLA. The center was recognized for creating a unique association of colleges and universities, called the Safety Training Consortium, that produces and shares high-quality online training materials on laboratory safety for researchers and satisfy regulatory mandates from the Office of Safety. The courses, which are used nationally, are developed to educate researchers in areas related to laboratory safety, and are interactive and engaging, with videos and animations. The UC Center for Laboratory Safety works to improve laboratory safety not only on UC campuses, but nationally and beyond. Its mission is to conduct and sponsor research on laboratory safety, develop evidence-based best practices for researchers and to communicate laboratory safety practices. The center also provides small grants for research on laboratory safety. The Campus Safety, Health and Environmental Management Association was created in 1954 to support college and university-based environmental, health and safety professionals. Nancy Wayne, professor of physiology and associate vice chancellor for research at UCLA.